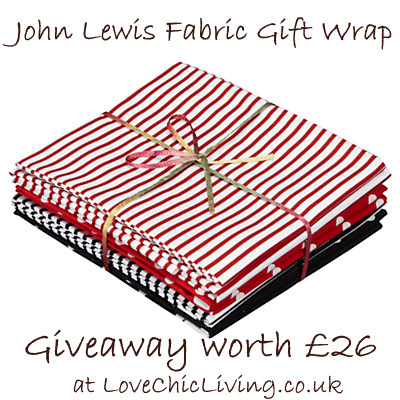 I am really thrilled to be hosting this gorgeous John Lewis Fabric Gift Wrap Giveaway this week, as we hurtle towards December, Christmas, gift purchasing and the ultimate wrapping. Give your gifts that wrapping wow factor with this gorgeous bundle containing 8 assorted pieces of fabric; each piece measuring 50 x 52cm. Made of 100% cotton, reusable, machine washable and suitable for most craft projects, this lovely prize in red, white and black will ensure your gifts look fabulous this Christmas. There are two ways to enter the competition. You MUST do the first, with the second being optional. If you do the second one, let me know in the comments. When do you wrap your Christmas gifts? You may also subscribe to the RSS feed for this blog for a second entry. Leave a separate comment to let me know you’ve done this one. The Giveaway is open until Midnight on Sunday 2nd December and the winner will be chosen by random. Please ensure you leave your contact details when you enter. The full Terms and Conditions are detailed below. Terms and Conditions: UK entries only. Entrants must leave a comment on the blog for entry into the giveaway. Entrants may also subscribe to the blog RSS feed for a second entry. They must leave a separate comment stating they have done this. The competition will close at Midnight on Sunday December 2nd. The winner will be chosen by Random Number Generator and contacted by email. The winner’s name will then be posted on the blog. Please leave contact details. The winner should respond within 7 days of being contacted. If no response is received Love Chic Living will chose another winner. The prize will be sent direct from the John Lewis PR company once the winner has responded. Love Chic Living’s decision is final. Always the night before in a hurry 😉 You see, I’m Spanish, shops in Spain always (beautifully) wrap items for you any time of hte year, in fact they ask if you want it gift wrapped when you get to the till. At Christmas time stores pull out all the stops, with trademark paper, ornaments, labels… it’s amazing. So this whole DIY wrapping was a shock to the system for me as, except for any homemade gifts, I never really had to wrap presents. ~I try and do them as I go along but it all depends who’s in and who’s out at the time. In my head they are all wrapped on the 30th November, in reality Christmas eve with wine, chocolate and telly. I like your system, I have no patience for it either! I wrap them as soon as i buy them! I would like it to be different but it is generally the day before they need to be given! But I LOVE wrapping, love love love it! After I have bought them all so they are ready to be delivered and there’s no chance of naughty eyes snooping! About a month before Christmas, ready for visits. I wrap most as I buy but with so many gifts to get my only resolution is that everything will be wrapped by the last day of November- and yes, this year, they are all done. I always do it well in advance and do it all at once! i wrap as i buy them and usually just do the last minute ones on christmas eve. I love being organised so I’ve already wrapped my presents! I normally do it about 5-6 weeks before Christmas, and I spend ages making the perfect little bows etc.! I try and wrap in advance but this year I think I will be up wrapping into the small hours of Christmas day, I feel very disorganised! I wrap mine the day I buy them. Then I am just spending the odd half hour here and there, rather than spending a whole weekend. I hate doing things last minuet. I wrap when ever I get 5 minutes so it gets done slowly but gradually. Christmas Eve, with a large glass of wine and a panic-stricken look..
Pacing yourself is the key a few a night over the month and voila, they are done with the minimum of fuss! I try to take a few minutes during the day, with a cup of tea, while my children are at school to wrap presents as I buy them. Must label as I go along, as one year I did not and could not remember what was inside so I had to rewrap a few! I spread it out from about the end of November onwards, but I don’t start to wrap anyone’s gifts until I’ve bought everything I’m going to get for them. I like to wrap a week before christmas. I like to make a night of it watch xmas movies wrap pressies and a nice glass of wine! Mine is wrapped in brown paper with ribbons, cord and nice tape. I usually do it around a week before Christmas – I always mean to do it earlier but never seem to get chance. What a wonderful prize! Subscribed by email as RSS feed link did not work for me. My husband and I wrap the pile of presents about 1 week before the big day with red wine for him and bubbles for me, rubbish on the Television and possibly some nibbles to stave of fatigue as that makes the whole thing go along in a Christmas to come kinda way! Christmas eve me and my partner wrap each others pressies, I get the nice warm living room and he gets to go upstairs to wrap mine :-). Everyone else’s get wrapped on the day we go to visit. christmas eve so i can keep looking at it! somehow, always at bedtime, so am surrounded by presents and paper and cellotape and gift tags, but am too tired to do wrap anything properly or remember which present is for who! As soon as I get them home. I try to wrap presents during November …. I’m quite a bit behind this year though! I always left it until the last minute and then wished i had done it earlier so this year they are all brought and wrapped already , how pleased am I ! I nominate an afternoon to it around the 20th Dec, switch on the Xmas CD and get going. I wrap and label as I buy my gifts. I love to see the pile of decorative, colourful parcels grow.. It looks very feastive. Early December, so they’re wrapped up before snooping eyes see them. The day before Christmas, ouch! I do my wrapping on Christmas Eve usually – I must get more organised! I wrap them as soon as I buy them, that way if they do get found the presents still remain a secret! I wrap them over a period of time, November and December. There are usually a few to wrap the night before! i wrap them as soon as i buy the gifts. so it could be a month before of the night before xmas!! I wrap my presents while my children are at school and my baby is asleep, I managed to get a few done at a time so have to start fairly early to make sure they are done. We usually make a night of it about a week before Christmas – we put a bottle of mulled wine in the slow cooker, ;put some Christmas tunes on and settle down on the living room floor to wrap! I wrap from now until Christmas making individual gift tags as I go. I wrap them as soon as I get them – usually in October/November! I love Xmas so much!! I start wrapping them after I have put up the decorations (usually the first weekend in December) and carry on until Christmas Eve. About 7-10 days before Christmas Day so they are ready to be exchanged with my family who I don’t see on Christmas Day. I am normally an organsied wrapper and do it as I go along but this year I seem to have taken on a trait that all the women on my mum’s side have and can see myself still wrapping presents at 1-2am on Christmas morning with a glass of wine and my hubby keeping me company…and awake. I wrap them when I get the xmas tree out because I love seeing the wrapped presents sitting under the tree. I usually wrap mine as I buy them but always at least a week before christmas as I’m not good at being last minute ! I wrap my presents on Christmas Eve or Christmas Day. I’ve subscribed to RSS feed! I always wrap them when I have bought everything and do it all in one go! As long as they are ready before 1.am Christmas wil be just right! Don’t like wrapping so tends to be as late as possible. I try and set an evening aside as soon as we’ve bought them all, so we can do it all in one go. However, we usually end up doing it all the night before, because we’re so busy and don’t get round to it! Mid Decemeber whilst playing christmas music! In a massive rush on Xmas eve usually. One year I might be organised! When the children were little I used to take them out of their hiding places at night and wrap them up in the days before Christmas while they were asleep. Nowadays its whenever I want too! A couple of days before christmas day with a glass of mulled wine and a christmas movie! About a week before when I’ve got everything I need. Otherwise I forget what I have bought! Also gives me the chance to switch my gift recipients if needs be. I’m forever changing my mind! And promising myself that I’ll be better organised next year! Christmas is nealy here, so planing to wrap them in time this year. Wrapping them nicley with ribbons and bows, some little ones with hidden confetti, good for a giggle you know! as the wrapping reflects all your love and the effect you made. I always seem to leave wrapping up till the very last minute and it always seems to be when the family are about and I’m most likely to get caught doing it. I’m wrapping some of them tonight, and the rest will get wrapped over the next two weeks….. I wrap them up as I buy them. I usually leave it as late as possible as they get wrecked otherwise!! I usually wrap my gifts about 3 days before Christmas. I like to buy everything before I start wrapping so I remember exactly what I have got! The week before Christmas, because on Christmas Eve I’m to far gone to wrap up presents, so we make sure they are done. I try to set aside the Sunday before Christmas to do my wrapping. But I usually find myself hurrying to do last minute wrapping right up until Christmas Eve. They get done as soon as I’ve got all of the presents boughts. Do it all at once! I tend to start during the week before. I have so many to do, i want them all looking freshly wrapped! I tend to do it a couple of weeks before. I like to wrap my presents up so they look really sophisticated with beautiful wrapping paper and bows. I do a few bits early, but most of the presents are wrapped on 23rd December and then hidden until Christmas Day. Any earlier and my young boys would find them. Wrapping presents on Christmas Eve always takes longer than I think and I end up tired and grouchy on Christmas Day, so…23rd December it is. The week before for everyone but the kids – kids are done xmas eve when they’re fast asleep and I’ve done a trip to my mum’s to retrieve where I’ve hidden them! I wrap all my gifts in November so it is out of the way and I can get exctied throughout December. Yay! I try to set aside a whole afternoon and spread everything out on the dining table. Add some Chrismassy music and I’m away! I wrap my presents usually just in time for the beginning of December so I can pop them under the tree. My little one is usually so excited (along with me) that we want our tree up as soon as it’s December and a tree needs presents! Usually in a few batches on Saturday evenings with a glass of wine or two! i usually end up wrapping on xmas eve. i always say ill do it before and cant be bothered! Whichever night my husband has his Christmas party so I can do everyone’s at once! Every year I promise myself that I’ll wrap early – but I’m always desparately trying to get them all done in the week before Christmas! Once presents are bought, normally by December. I like to wrap my presents, write my cards and relax few weeks before. I wrap them as soon as we arrive at my parents house (usually flying in from somewhere, as my husband is in the Army) this year that will be xmas eve!! Always at the last minute! Usually just before I am about to give them! Christmas officially starts when the presents are wrapped! I wrap them the day before the tree goes up with a glass of wine and cheesy Xmas songs on! I like to wrap them when I buy them to stop little eyes from checking out what I’ve bought! Every year I promise to do it all by 1st December. And every year I’m doing it in a grump, frazzled out on Christmas eve! I always wrap them late on Christmas eve, but this year I’ll do them earlier. Usually just before I have to give them/post them! usually late on Christmas Eve and I run out of paper and have to run around borrowing some from my long suffering next door neighbour! Normally the weekend before christmas. Always the night before, wedged up against my bedroom door to stop anyone coming in. well I start mine in August as we have friends that come to stay & we have a summer christmas together, but presents for the actual proper christmas day I start wrapping early December & put them in the spare room until Christmas eve then I fancy them up with ribbons, bows, glitter etc.